By improving our understanding of the maize plant, its nutrient requirements and uptake, we have a better chance of getting the greatest benefit from our fertilisation programmes. Each different nutrient has an important effect on crop nutrition and it is important to find a correct balance between macronutrients and micronutrients for maize crops. Nutrients in the soil are taken up by the roots of the plant after which they are translocated within the plant reaching the stems and leaves. Decreased water availability in the soil reduces the movement of the nutrients and when this is the case, plant growth is hampered. Plants suffering from a deficiency of nitrogen tend to show stunted or sparse growth. The leaves turn a pale green. The oldest leaves show yellow discolouration and necrosis (the dying of cell tissue) starting at the tip of the leaf. 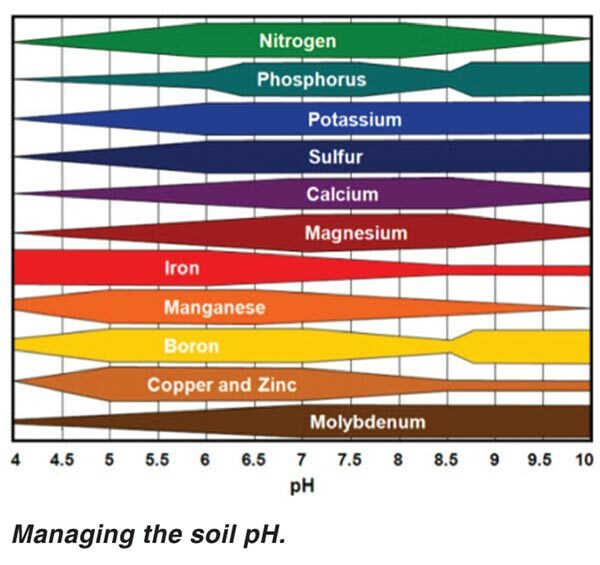 Low or high pH soils make the problem worse as do sandy and light soils because leaching takes place with the nutrients draining away through the soil too easily. This can be caused either by heavy irrigation practices or high rainfall. Nitrogen is critically important for lush green growth of the maize plant and contributes towards significantly increased yields and better grain quality. A maize plant requires both nitrogen and phosphorous soon after germina-tion to stimulate the growth of stems, leaves and ear structures. The majority of nitrogen is however needed during the period of maximum growth which is the month prior to tasselling and silking. Young plants suffering from a deficiency in phosphorous are stunted and thin with dark green leaves. Leaf margins, veins and stems show tinges of purple which may even spread across the whole blade of the leaf. This reddish discolouration is usually visible mainly in the juvenile stage of the plant’s life. Acidic and very alkaline soils worsen the plants as do cold and wet conditions. Crops with poorly developed root systems struggle without enough phosphorous so it is very important to get the levels right to ensure good early plant development which will contribute towards even maturing and reduced grain losses at harvest. The cobs of plants which have been deficient in potassium are noticeably narrowed or peaks and the grain on the tips of the cobs will have been poorly filled. The problem is worsened by acidic soils and sandy and light soils which leach very easily and quickly. 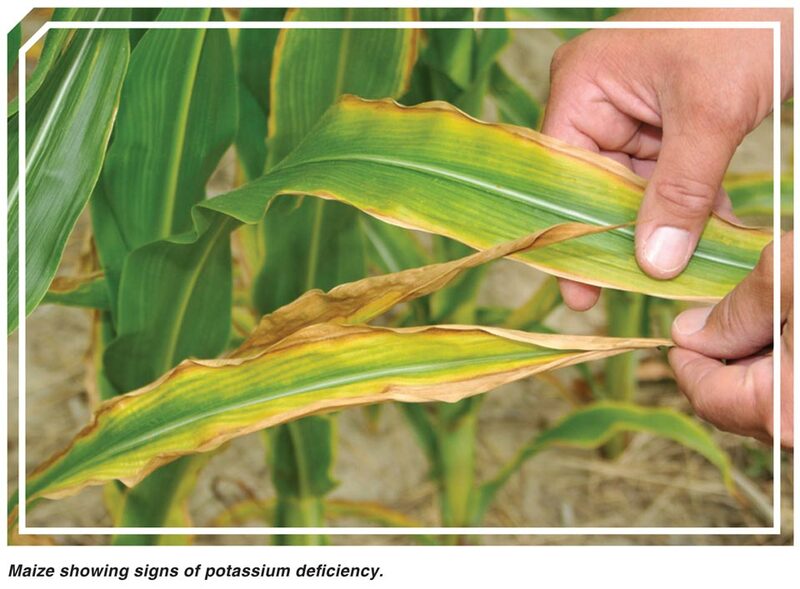 Drought conditions and high rainfall or heavy irrigation are equally problematic when the balances of potassium are not correct. Potassium is important for healthy green foliage and ensures optimal root growth thus contributing towards increased yields. Symptoms of magnesium shortage in the maize plant are seen in the leaves which show up red and purple tints and have a streaky appearance. This often occurs after extended periods of cold and wet and in soils which are too acidic or sandy. 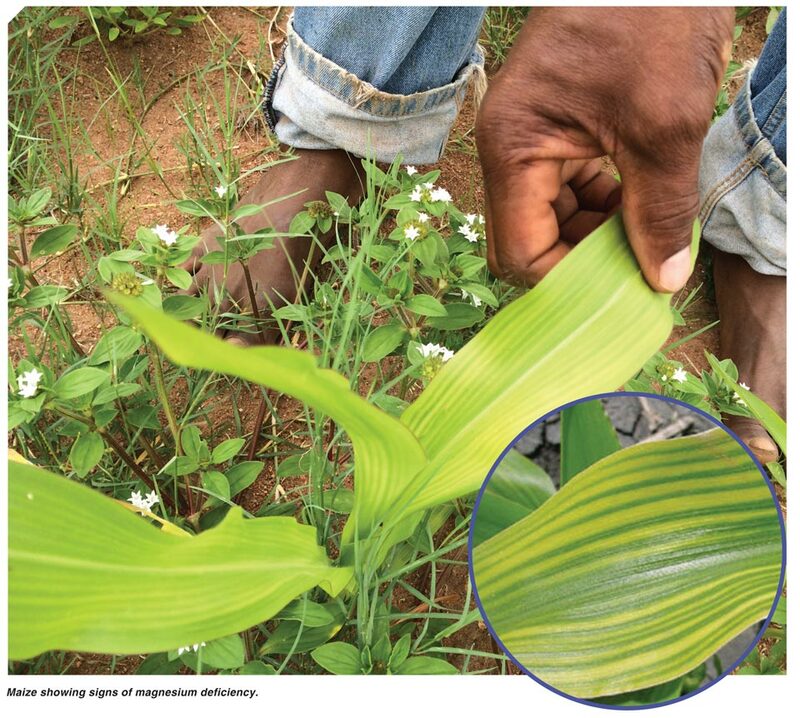 Magnesium contributes towards healthy plant development early in the season and improves yield. It can also help with the maturation process of the plant and thus bring forward the date of harvest. Calcium shortages become evident early on in the growing season and are seen on young leaves which exhibit a light green colour or even whitish spots or streaky lesions and can even be hooked back. Calcium is important for healthy foliage and contributes to improved quality of grain and increased yields. The maize plant will seem stunted with quite a straight up, erect appearance when sulphur is in short supply. This is made worse in acidic soils as well as light, sandy soils where leaching is a problem. It is also exacerbated by soils with low levels of organic matter or if the soils are poorly aerated or waterlogged. S contributes to green foliage and healthy growth of the maize plant and contributes to an effective uptake of nitrogen by the crop. Plants short of B present with stunted growth and either yellow or white spots develop on leaves with brown waxy raised streaks as the effects of the deficiency develop. 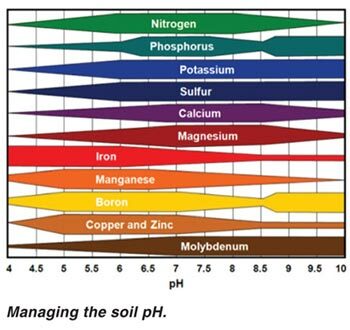 It is worse in sandy and alkaline soils and also soils low in organic matter. This will also happen when there are too high levels of nitrogen or calcium. Periods of drought also worsen the problem. B is particularly important for cob and kernel development. Zinc deficiencies are seen in the leaves of the maize plant which has pale yellow zones which start at the base of the leaves and run up the sides of the midrib while the leaf margin, tip and the midrib stay green. There may be a hint of red at leaf margins and on the stems of the plant. These symptoms generally show on older leaves, internode growth is reduced and gives the plant a stunted or dwarfed appearance. Zinc is important for good plant development early in the season and helps improve yields as well as speeds up the maturation of the plant to bring the harvest date forward. Clearly, micro-nutrients play a very important role in the life cycle of a maize plant so for every farmer to be able to achieve top potential yields, it is important to take regular soil samples for analysis. On the basis of the information returned, apply the correct fertilisers according to the recommendations ensuring that the proper application rates, methods and timing of application are used.